Hoppy nose with small amounts of malt coming through. One finger tan head that has minimal lacing on the glass. Full hoppy taste up front with rich roasted malt caramel taste. Wow! Grge Kcoh in the houose at the 2010 Beer Blgoggers Conferererence! And he broought us a littel soemthing very spceial. Lukcy 13asartd. That's rihtt, not a typoo, see the btottle in the photo. We are a bnunch of Lukcy 13asartd's to get soeme of this. We aren't supposed to be talking about it yet*, but....who can keep a secret. This is very delicious, not just saying that 'cause it's complimentary. The 8.5% alcohol is barely noticeable, except for the warmth. Silky smooth finish that promotes the malt character, after the hops have just ripped your nose. Get some..uh, that is, when it's released........soon. Muahahahah. Finally, I am worthy! 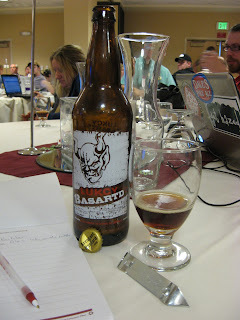 *Review done live, as it was poured for our sampling, from the 2010 Beer Blogger's Conference. This beer will be released soon.